Thanks. My friends have given them genitalia-inspired nicknames. ok then, now I understand the odd orientation of the photo. 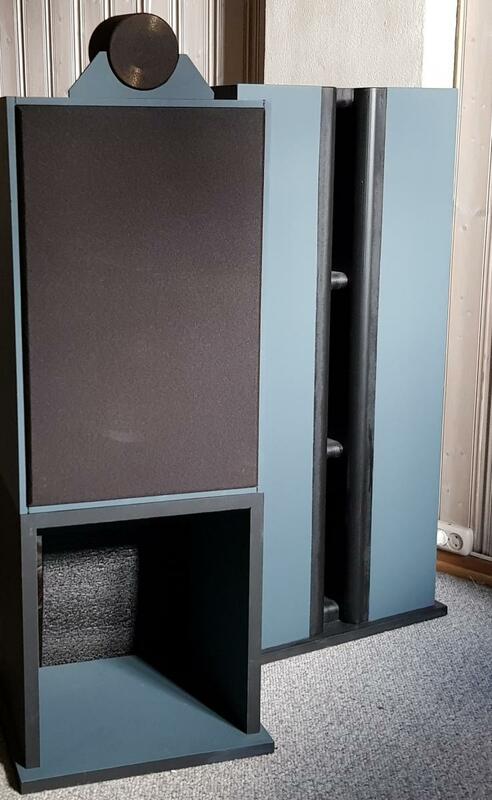 Almost finished my small computer speakers. Tangband w4-992s 4" woofer/midrange. I had to change the dust cap to a smaller one because I found out that original cap had really nasty resonance at 2.5-3kHz). 12dB crossover, 2kHz co fr. Zobel network for woofer. Anyway, these are pretty good as being made out of pretty cheap drivers! Bass is nice, no boomy. Midrange and highs are natural, neutral, easy to listen all kinds of music. Maybe just a tiny bit of harshness around 2kHz, going to try 2.5kHz or even 3kHz crossover fr. for tweeter (less overlap). All in all, results are satisfying so far. Measurements made at 0.5meters and from reflex tube. See that 600Hz dip, there is something which I need to figure out (standing waves or reflections possibly). Stuffing did not make much difference.. Some 3 way towers I am working on at the moment. 2 Hivi M6a woofers a Monacor MSH116 mid and an XT25 mounted in a waveguide. Just waiting for the crossover components to arrive. Latest build I'm working on. Aurum Cantus AC250F1 woofer, Audax HM130Z4 mid, and LCY108 tweeters. Woofer is in a sealed box and mid is OB. The crossover is a serial topology @ about 300 & 4K. So far the woofer enclosure is veneered in Rosewood and will be trimmed with Wenge. The MT part is still being thought about, lots of ideas, nothing set in stone yet. Last edited by 6thplanet; 11th April 2019 at 12:36 AM. How do you rotate the pics???? Ugraded the looks of my speakers. The inside still the same as before. and Fostex T500 mk.ll on top. Digital x-over and EQ with Audiolense, JRiver, RME and NUC pc. Well, posted them before, but now from another angle! Is that JBL D130? If yes, thunk the Vb is too small. It feels very good in 5-8cuft. The bigger the bettet. But its a fantastic extended range driver.